If you like decorating in a shabby chic style, you may consider incorporating some milk glass into your designs. Milk glass are those pieces of dinnerware or vases and accessories that are an opaque white with either a hobnail or other decorative pattern etched into the glass. They really make a pretty accent either on their own or in groupings. 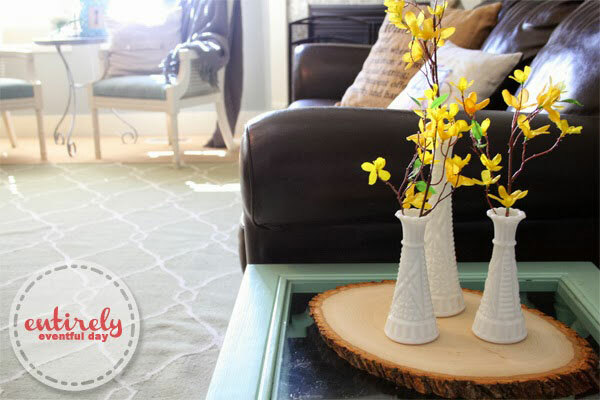 Check out these ideas for displaying milk glass. 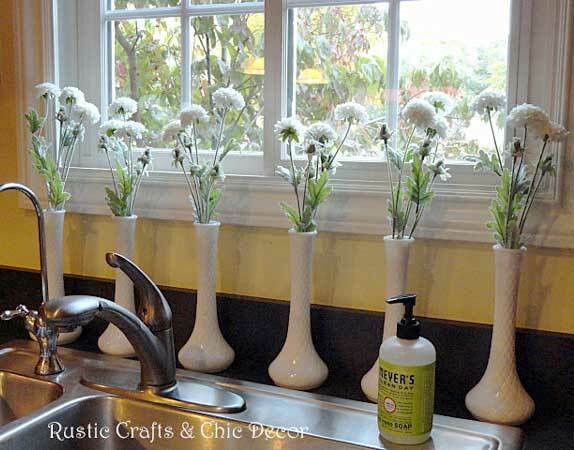 To add some interest to my kitchen sink area, I simply lined up six vintage milk glass vases that I filled with silk carnations. With the holidays coming up, this is a beautiful way to make an elegant and festive display. Colorful ornaments pop when displayed in a crisp white milk glass dish. 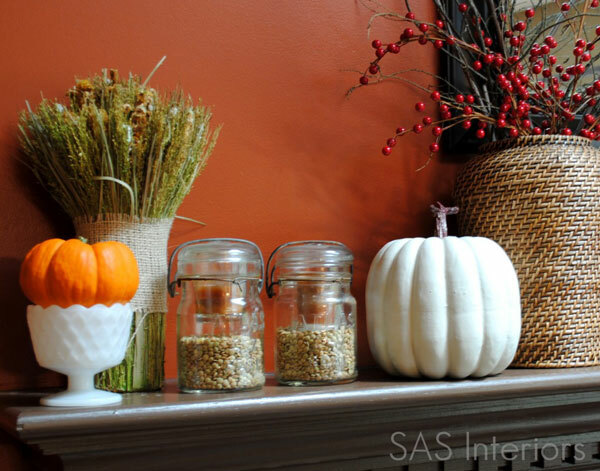 Here a small milk glass dish is used to prominently display a pumpkin on this vintage inspired Fall mantel. 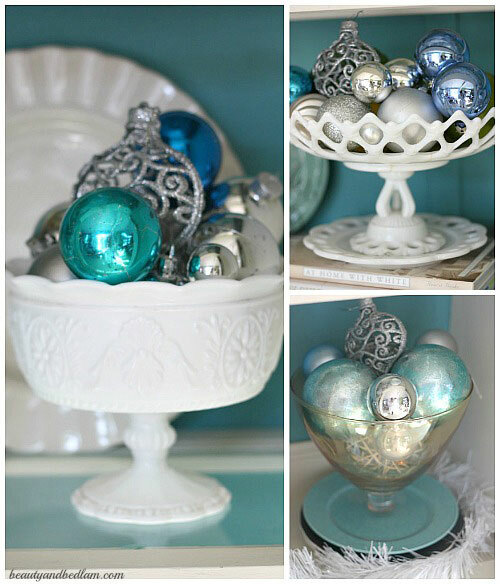 More holiday decorating with Ms. Macs Antiques and a milk glass dish accent! 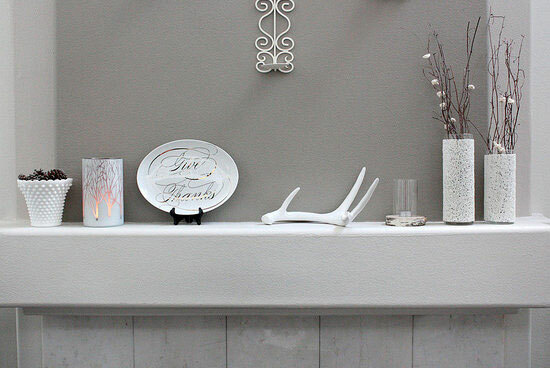 This Thanksgiving mantel is a perfect example of how well vintage milk glass looks with shabby chic decorating. The fact that the glass is white is the first plus and then the vintage styling make is so charming. I love the dark moss of these centerpieces. The grouping is made especially shabby chic with the addition of the old book stacks. 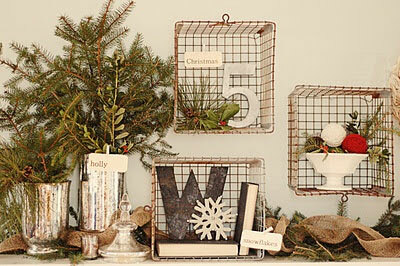 And finally, this rustic chic display is one of my favorites. It’s perfect for Fall decorating but really works for any season. I love the wood slab that is placed under the grouping of the vases. 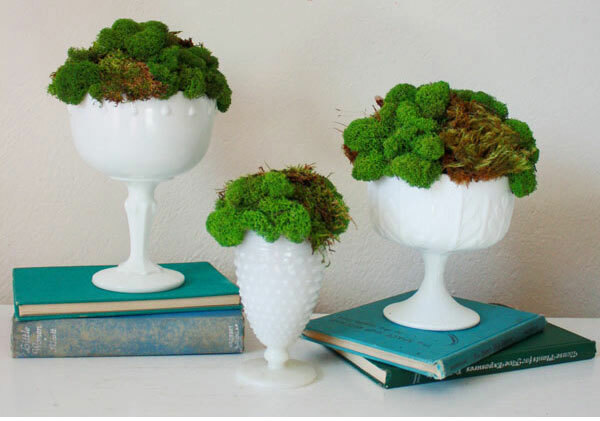 Would you use milk glass in your decorating? I hope you have been inspired!